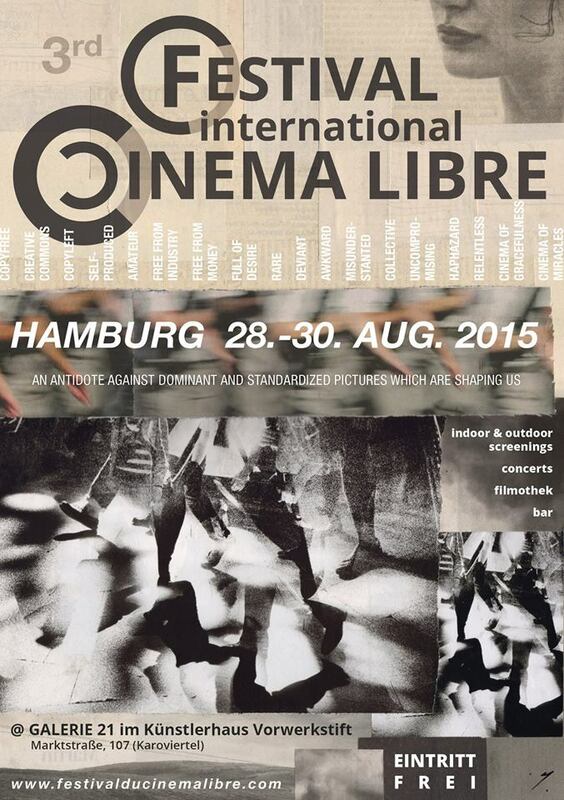 “The White Widow” (2015) is selected for the 3rd International Festival Cinema Libre of Hamburg (Germany) which will held from 28th to 30th August 2015. Cinema libre differs from the cinema made by industry, television, business, entertainment, motion picture, technology and money. Free from rigths, under licence art libre or creative commons, it is shared and can be diverted without tethers. To be independent from the film industry, movies can be self-produced, crowd funded and/or be produced with no money at all. In the last decade, digital technologies extended the space of cinema libre and enabled everyone to take back this way of expression swallowed up by industry for decades. Analogue formats are also coming back as a way to explore and experiment things thanks to alternatives and shared laboratories which are growing up everywhere in the world. Cinema libre has something to say, something to shout about. It does not pay attention to public expectations. It is neither a job, nor a business. It does not look for a return on investment. It ignores codes, formats and fashions. It is a cinema of experiments and it is often based on DIY, sharing, lightness and freshness. Cinema libre places poetry before technique, life before show, and facts before effects. It is the antidote to the dominant and standardized pictures, which shape us.